Lidiya Vasilyevna Kurpa started management of the Department of Applied Mathematics since 1995. L.V.Kurpa started her pedagogical activity in 1969 after she had obtained PhD degree. Her scientific supervisor was V.L. Rvachev. At the beginning of her career L.V.Kurpa took the position of assistant professor and later the position of associate professor of the Department of Applied Mathematics. 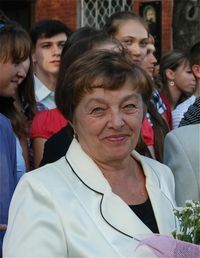 In 1980 she gave up pedagogical activity at the Polytechnic Institute and began working at Kharkov Institute of Machine Building Problems at the Department of Applied Mathematics and Computational Methods. Under the direction of V.L. Rvachev she performed researches concerning solution of vibration problems for plates and shallow shells of arbitrary form by the R-functions method. The results of these investigations have been published in 3 monographs and more than 250 papers. In 1990 L.V. Kurpa defended Dr.Sci. thesis “Development of R-functions-based methods and software for solving problems of bending, vibration and stability of thin-walled structural elements of complex shape”. After obtaining Dr.Sci. degree she renewed her work at the Department of Applied Mathematics as a professor and later as the Head of the Department. Under the management by L.V. Kurpa the Department has gained considerable success in scientific and educational activities. During last years (2010-16) scientific workers of the Department wrote more than 70 research papers and more than 20 textbooks. The results of investigations were presented at well-known scientific conferences. Development of the methods for solving non-linear problems of vibrations of laminated plates and shallow shells of complex shape. Researches of nonlinear vibrations of orthotropic plates with arbitrary form by the R-functions method. Proceedings of the 2nd International Conference “Research and education”. Miscolc, 2004, pp.109-114 (в соавторстве). R-functions in physically nonlinear problems of a bending of plates. Proceedings of the International Congress “Advances in Systems, Signals, Control and Computers”, Vol.2, 1998, p.7-10 (в соавторстве).